Turning your traffic into leads just got easier: we’ve built a tool for importing backdated lead records into your process. Import files can be as large as 5000 records and should be in CSV format. Details coming soon - LeadGen Data Retention lets you decide how much historical lead data you want to store in your account. Questions? Contact LinkTrust Support or Sales. 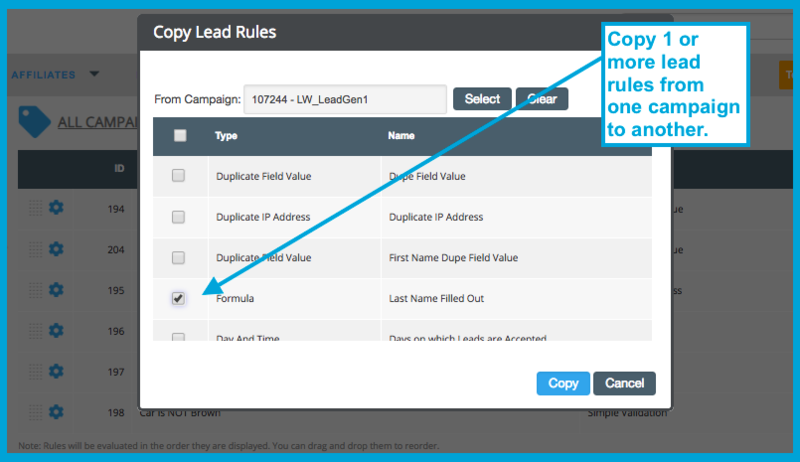 Create new campaign lead rules by copying from one campaign to another. This copy functionality works the same as with your lead data fields. We’ve built out our lead distribution settings to support multiple channel header names and values. Formerly, you could enter a single name-value pair per channel. Now you can configure many additional name-value pairs, one to each line in a new text area in channel settings. You can perform a search at the Affiliate Listing page then click Mass Action to assign or unassign those affiliates to a group. You can also go directly to the Mass Action page then identify affiliates for which you want to perform either task. When copying/cloning a campaign, your new campaign will be advertised to affiliates under the same name as your regular campaign name - unless you use the optional field when copying to give it an ‘Advertised Offer Title’ in addition to the regular name. You can decide to make system-generated links and pixels default to https or http. This functionality is provided at two levels: 1) at your account level (Default Campaign Settings); and 2) within each campaign (Campaign Basic Settings). At various places in the platform, multiple affiliate websites can be entered and/or displayed. Previously limited to a single company website, now affiliates can add multiples during the signup process and view in their My Account page. Partners can add or view at affiliate details, and pending/denied affiliate applications pages. Partners can also search by website URLs at Affiliate Listing as well as export including these URLs.